From the first time I saw and heard Alan and Marilyn Bergman in 1996 at the first Tin Pan South, I had dreamed about actually meeting them. But it wasn’t until we began a class of their music at Nashville Jazz Workshop in 2006 that I began emailing them. Marilyn supplied me with alternate lyrics and a few suggestions as to what songs to consider for the class. Then in 2010, I happened to be writing with Rick and Janice Carnes, who have had much success in the Nashville songwriting business (Rick is President of the Songwriter’s Guild of America), and I mentioned that my favorite writers were the Bergmans and I would love to meet them someday. Rick said, “No problem. I serve on several boards with them, and I’ll call Alan and make an appointment for you.” As you can imagine, I was out of my body! Conveniently, I was scheduled to go to L.A. to play for a birthday party, so the call was made, and I confirmed the appointment with Bergmans a few days later. It wasn’t long before I found myself sitting with the Bergmans in their writing room. I think my heart stopped several times, because it was just so exciting for me to meet them. They were so nice and down to earth and were very interested in what we do at the Nashville Jazz Workshop. When I told them about NJW, they were impressed with our classes and were very complimentary of our contribution to the American Popular Songbook. I really wanted the concert to be about my students and NJW, not about Nashville’s Music Row, so we kept our news under wraps, while we invited as many VIP’s as we could think of. At this point, I asked Sandra Dudley, who has always been a huge fan of the Bergmans, to sing a few tunes at the concert. That night only a few of us knew that Alan and Marilyn were there. It was Sandra who introduced them to the audience during the performance. Then, at the end of the concert, the Bergmans came up on the stage and said some very lovely things about the NJW. Alan whispered in my ear, “The Way We Were in A-flat.” After Marilyn said a few words, the band and I accompanied Alan as he sang The Way We Were. It truly was a moment in time that none of us will ever forget. The next year, in November 2012, Sandra and I decided to record an entire CD of Bergman tunes and began listing all the tunes we loved (many more than we recorded). 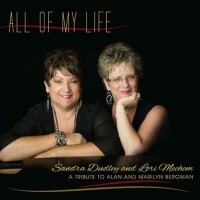 When I called the Bergmans to let them know we wanted to record a tribute CD of their songs, they were thrilled. I asked Alan if he had any tunes that had not been recorded, and they sent us six. We chose three that would work best as a duo. Two are premiers: “Mozart in the Dark” (music by Ivan Lins and Vitor Martins) and “Being Without You” (music by Cy Coleman). The third song we picked, “Kisses,” was another Ivan Lins/Vitor Martins song and had previously been recorded only once – in the 80’s by Sergio Mendes. We began recording in August of 2013 at Wildwood Studios with Brendan Harkin engineering and Roger Spencer producing. Both the piano and setting were perfect, and Sandra and I connected on the highest musical and spiritual level that we could have imagined. After we mixed, we sent Marilyn and Alan a copy of the CD. They called me one afternoon and said they had no idea that the project would be this good. Marilyn said they wanted to listen more intently and would get back to me with their notes, which they did – a few corrections of lyrics and interpretation.